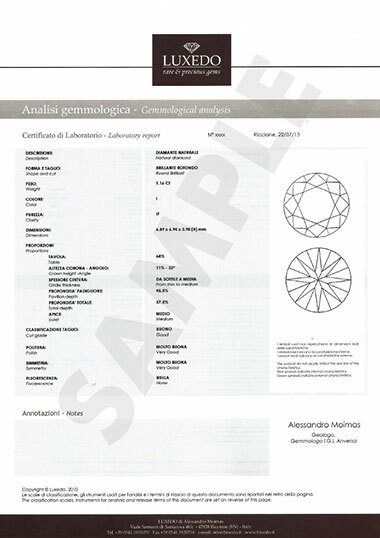 "A gemological certificate is much more than a seller Guarantee"
""We are an independent laboratory with professional gemologists"
A gemmological analysis gives not just a guarantee on the gemstone but also parameters for an economical appraisal. A certified gemstone can be easily evaluated as its certificate objectively describes gemstone features for its grading and quotation in the marketplace. How to recognise a quality gemstone? A limit in the development of knowledge and culture of gemstones is the fact that many “expert” retailers keep saying that there are no objective standards in gemstone evaluation. If so, the client could only trust his retailer and hope the best possible option is the one he has been offered. But there are standards, precise evaluation and grading methods used in gemmology (the science that deals with gemstones) and these standards come from mineralogy, geology and optics. The gemstone expert is called gemmologist and is the only professional expert in gemstone certification and the only one who can issue a Gemmological Certificate, the document that proves gemstone origin and supplies all the data for an objective evaluation. The criteria to objectively evaluate the beauty of gemstones have been developed through the years and can be summed up by the Anglo-Saxon 4 C’s formula: colour, cut, clarity and carat. The quality and beauty of a gemstone are related to the balance of these 4 parameters. The price of a gemstone depends on this balance, also in relation to rarity and market demand of the gemstone itself. Therefore the gemmological certificate gives the client the guarantee that the purchased product has a proper objective value. What can a gemmological laboratory do for me? From a scientific perspective, fine gemstones are minerals; they are one of the most important components of Earth’s crust and they differ in chemical formula, physical and optic properties. Gemmology is the science dealing with gemstones. The aim of a gemmological laboratory is to identify both natural and synthetic gemstones (i.e. manufactured in a laboratory) and recognise possible treatments the gemstones went through as this would depreciate their value. 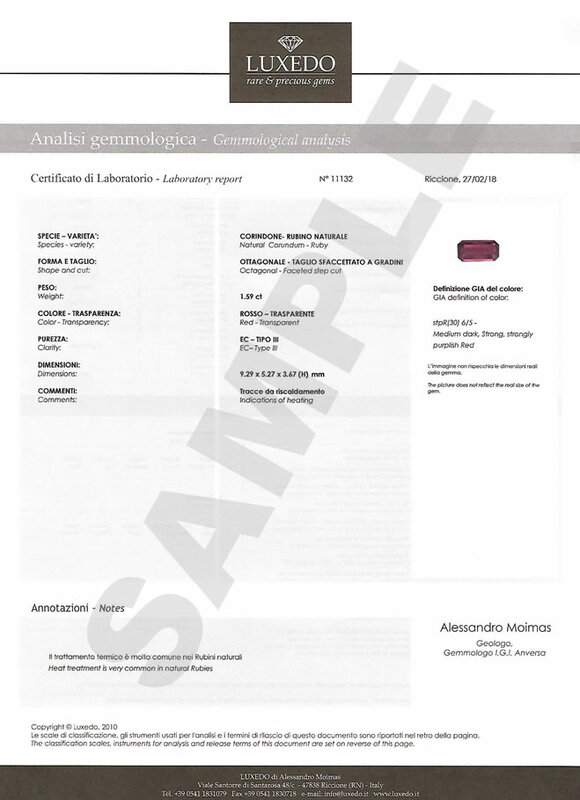 Gemmologists make a lab analysis and then issue a gemmological certificate that is the summary document with a recap of all the analysis made and a description of the material analysed. A simple guarantee issued by the retailer is sometimes not enough to guarantee the adequacy of the purchased product with its market price. The description of certain features are of great importance in the determination of the actual price of the gemstone and they can be missing in the guarantee certificate. The actual price may in fact be different from the supposed price or the retailer’s selling price. A gemmological analysis describes in a scientific and objective way the gemstone features that are the parameters for its classification and market quotation. Knowing that your gemstone is a ruby is not sufficient to establish its value because the price of a ruby can vary tremendously (from a few dollars per carat to thousands dollars per carat for the finest specimens) depending on the nature and the type of treatments the gemstone has undergone. It is difficult for the untrained eye to recognise the different types of treatments that are not always long-lasting and just enhance the original material. the fifth is not natural but manufactured in a laboratory, so it has an infinitely lower price compared to a natural ruby. It is important to know about these treatments and it is far better to have a written record as you may buy a beautiful artificially coloured gemstone for the same price as a natural one…and this would not be a good deal! Our laboratory is equipped with modern tools of investigation such as dark-field microscopes, refractometers, polariscopes, spectrometers and digital scales for gemstones identification and quality analysis. Above all our laboratory has our gemmologists’ knowledge, skills and experience. They keep themselves updated on the new gemstones that appear in the marketplace and on new enhancement treatments. New synthetic gems that are very similar to the original natural gemstones. 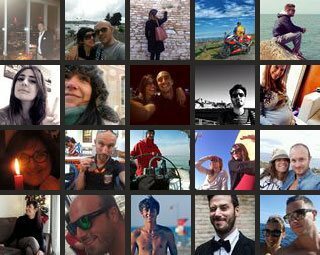 Only experienced professionals can recognise these treatments using laboratory results and specific tools. 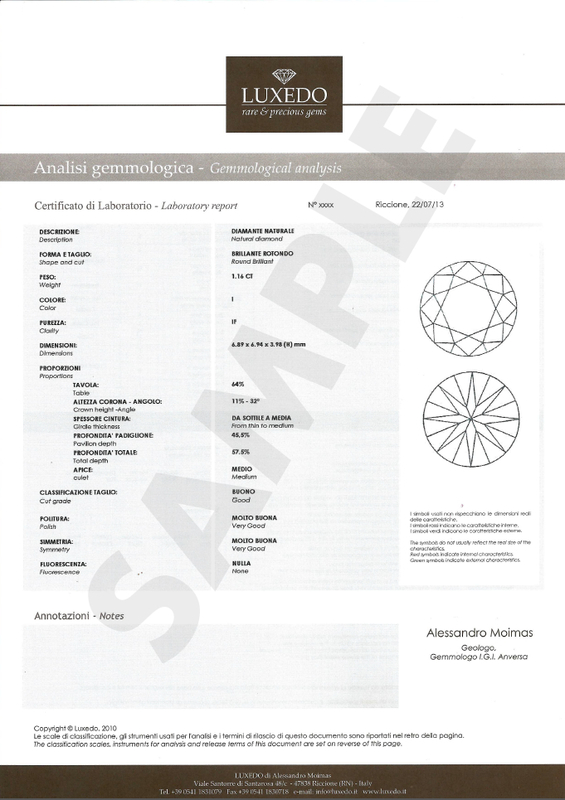 If you require a gemological analysis on your own gemstones, you can reach our laboratory: we’ll be happy to offer a free pre- analysis of the material and advise you on which type of certification to request or otherwise in case the material is not worth to proceed with a certification. 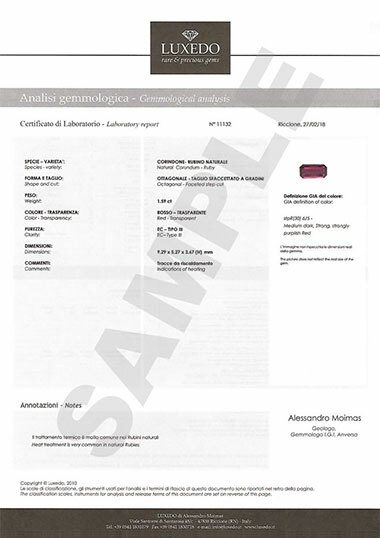 You can deliver the stones to be analyzed hand-carry or through courier at Luxedo Laboratory in Italy – Riccione (RN ) via Santorre Santarosa 48C. It is the faculty of our Laboratory not to accept the delivery or to proceed to the opening of packages received by courier whose case or seals appear to be tampered with or altered. The return shipment of analyzed stones or jewels and document analysis can be made through direct withdrawal at the Laboratory or by delivery through courier at the expense of the customer .